While the idea of sleeping in a pipe might not immediately connote luxury in your mind, this hotel design turns concrete pipes into quite the comfortable space for your next overnight stay. Almost like glorified camping, the DasParkHotel is a series of individual hotel room pipes, set on a beautiful flora-filled backdrop just steps from the Danube River. “The external simplicity surrounds an unexpectedly comfortable interior” as each pipe is outfitted with a bed, lighting, and other furniture, with bathroom and restaurant facilities shared in a public space. And what’s more, DasParkHotel obtains sanitation and other hotel facilities from existing public infrastructure, allowing them to operate on a “pay as you wish” system in which guests pay only what they can afford or wish to contribute. Now that’s some great communal living. Reminds of Kramer when he put the Japanese tourists in his large chest of drawers. Why not use this idea for the homeless? A few modifications and they can live in these rather than the streets or subways. I know I'm approximately a year and a half late on this, but does it not occur to anyone else that every other hotel room in the world usually has only one door, as well? A window on the 10th storey won't do much good, y'know. As for heating in winter... take a friend and snuggle up. Use you're imagination, and I'm sure it's not hard to create some heat. The idea is amazing! a private space to stay for a few days, better than being cramped in a hostel with stangers. If scared of fire DON'T SMOKE in there! EXTERIOR UGLINESS? Seems to me the thing to do is bury them in a low hill, with the entrance side exposed. This will also help insulate the tubes, for better cooling in summer, heating in winter. It is an ancient construction technique. First, you lay down a foundation of earth about 10cm high (to keep groundwater from getting into the pipes, if there is heavy rain and puddles). Then you put down several of these pipes ... bam-bam-bam - maybe 3-5 of them. Then, fill dirt on top of and between them, with about 20cm of dirt on top. Leave about 20 CM of the front ends of the pipes exposed (kind of 'jutting out' from your little artificial hill). Landscape it all, out, plant grass and so forth, and you're all set. INTERIOR UGLINESS? Well, I wouldn't have a big party inside one of them, but if you are worried about sound reverberation and appearance, some decorative textiles on one of the upper 1/4ths of the curved interior surface should do nicely. A tapestry of sorts. It could even be decorative carpeting (go see some of the oddly patterned carpet at hardware/carpet stores), as long as it has an interesting and warm appearance. Viola: Instant soft-to-the-touch mural. TRANSPORTATION COSTS/IMPACT? Most types of construction require a number of semi-tractor trailers coming in: Concrete pourers, skids of roofing material, truckloads of wood, etc, etc. With this, almost everything arrives on one truck. From what I've observed on the highway, it seems you could bring in 4 of them at a time. NOT ROOMY ENOUGH? Ok, so maybe its not for you. So move on, if that's your beef. A lot of people like the idea of a whimsical little snug room with tasteful decor. these are amazing little sleeping quarters! i'm just delighted to know they are being used and liked by travellers. they seem very cozy, and the round shape would be comforting. i love the storage under the bed -- that's awesome for backpacks, or bikes slid sideways. geez guys -- have you ever been in a concrete tube? they are solid, and the thickness would not allow it to get "HOT" in summer... they stay cool! and in winter i bet they stay warm! i used to skateboard in tubes and always thought how great they'd be for little "rooms"... they're nice and sound-proof too. i could see a short tube stacked vertically with a doorway cut out as a showering unit, with a solar system in the top section. park one nearby to offer showering accomodations maybe. as far as beauty, heck, if you don't like the look of concrete as it is (which ages beautifully IMO), then paint them. or tile them, or grow ivy along the side.. look on the bright side and envision beauty instead of saying "eeew." mmm, i'd like mine to have a custom stained glass window on one end, heck, on both ends -- with the entrance being two half circle doors. i picture some dark cobalt blue glass... like the bases of those dark blue water bottles... that'd be nice , sorta like a kaliedescope! add a nice round concrete or redwood deck out front that looks like a necco wafer (a pale tinted concrete maybe?) and put some colorful bauer oil jars on that.... a snacky lookin adirondack chair or someting.. dude.. stylin... it'd be great for the beach. better than a tent that will blow in the wind, ya know? okay, how about adding an awning for shade if you're worried about too much heat. that'd would be cool too, some canvas/steel pipe structure, something simple and adustable. 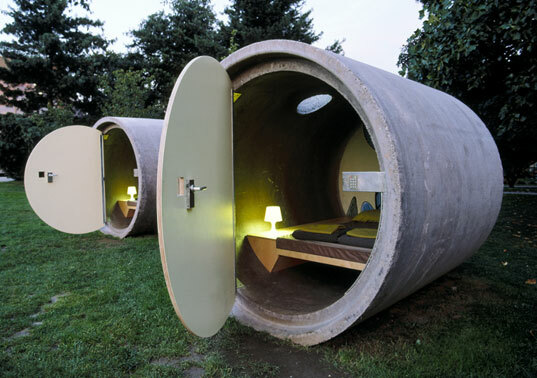 i'd like a set of these concrete tubes -- bedroom, breakfast room, party tube.. ! so many people just want to put down a wonderful, inventive idea... you guys are dorks, i swear! this is such an awesome idea! rolling downhill? please. just chock it if you're so worried about it moving, like we did when he skated. those things are so heavy they're practically impossible to move. COFFINS? what? did you obsess over kill bill V2? dang, sounds like a personal problem to me. unless you're mega-mega-fat and dumpy i doubt you'd feel like you were in a coffin with such a spacious tube. claustrophobic? for a few nights? didn't you ever go camping in a PUP tent? jeez. you all sound so friggin' spoiled! the tube looks like it has plenty of room! what, you need to fly around the sleeping space like a bat or something? get real! so yeah, i think it's very fromage too.. whatever that means! sure, make it slightly bigger, why not, but they seem all right to me. i'd park myself in one pronto with my honey, they look very cozy and safe. i applaud loudly for mr. strauss's inventive idea... and i hope to see these things around lakes and shores and the deserts of my country. GO TUBES! Very Fromage!!! I LOVE IT! pay as much as you wish - good is like a cheap version of a travel lodge! make them a bit bigger... perfect... get them to the uk!! cheap weekend away !! Not exactly comfortable looking, but i would rather sleep in one of them than a tent, especially when it is raining and the wind is blowing. Ah... C O F F I N ! Oh yes they need to add little path ways leading up to the pipes - perhaps? heyheyhey a lot of theories about a thing you never used. i stayed there 3 times and ( spring 2005 in linz and july and oktober 2006 in ottensheim ) to be honest. visite it and then talk again. its a more than a amazing feeling to be welcome, to feel secure and still be completely indipendent,....at the same time. think or knit theories about as much as you like ...........but i tell you its amazing !!!!!!!! great idea,not sure how id feel inside one of the pipes-claustraphobic probably! It sounds interesting - I am sure I will like it. What about ASBESTOS? I am slightly worried dear. All the same I amy try it someday. heloo people edner ruth and i think its a really great idea but it is a big too cramed ! and i think it would smell and get really damp and it would be really cold ! but we love the idea how great molly does not like it but ruth and i doo !! I agree with Walt Barrett and Amanda, tremendous!!! I would certainly use it if I was up that neck of the woods. Fireproof, bomb resistant, flood resistant, Bear resistant, what more could you want? If temperatures too extreme, spray the inside with foam and then clad. Bet you could roll them with a couple of large sticks, though, wouldn't that be fun for the occupant? To Jack 73t, "staid" means something like 'conventional', 'resistant to new ideas', or an English phrase, "Stick-In-The-Mud". (That's a point, if it rains a lot, will the pipe sink into the mud? It's very heavy! My first thoughts :, what if the door jammed? There ought to be a pop-out window at the far end, for that, or fire. Who cleans the bed? What about condensation formng on the inside? Concrete wuld absorb lots f heat in summer, and be stone-cold in winter. Shipping containers would give more standing room, but they too only have one door, and would need an emergency exit elsewhere. I've been in a shipping container (used as a store room) andit is a bit scarey : no escape if door jammed, and sounds can't get out easily. I'd find it claustrophobic, sorry. Seems like a gimmick , to me. This seems like it would be a great idea for a campsite. I have been thinking about picking up a small plot of land but putting a cabin on it would be to expensive. This would be a cheap alternative and would be fireproof, storm proof, water proof and vandal proof. oh man, i would have loved this as a kid...I think it's fun. What an embarrassing example of urban ignorance and egocentricity. Get over yourselves - those of you who have completely missed the salient point, to wit: these are some of the lowest impact temporary dwellings possible, that utilize ready-made structures/materials, and take advantage of public common facilities. And how about the fallacious thinking that homeless people having slept in concrete pipes = bad. I live in a city full of concrete towers jammed with tiny apartments. Would it make you feel better if they slapped some plaster on the inside walls and furnished them with Starck Louis Ghost chairs? On the contrary to all that ridiculous doubting-thomas-ry, these look positively perfect for a cozy, quiet and dark snoooze (at any price!) after a long day of taking in the sites. I saw homeless people live in these pipes by necessity. It is the ugliest project which I been able to see. Do people pay to sleep there? Talk about claustrophobia, what if the door lock or handle broke and you couldn't open the door. Scary just thinking about it. Better have a cellphone and some food handy, unless the pipe blocks the signal. Then what? Uh-oh. this could be real cool for our park systems, maybe work out a remote lock unlock code for the park and wildlife service to activate with say a driver licence to operate doors or a punch code that times out. this could be a cool camp like set up... maybe in groops in remote areas, its nice. look into standing one up with a door cut into side for out door shower. etc. reminds me of a catacomb... claustrophobic..you have to be joking .....stackable.. sorry this is stupid.. I agree with djfred....it's not supposed to be a five star hotel....and it's better than a tent. But what does "staid" mean? I'm w/ djfred - it's like upscale camping - so quitchyerwhining! I think it is an interesting idea, but it needs a little more thought. Better ventilation and more private bathroom facilities would be necessary for me to stay there. I'm sure with more tweeking the concept could really take off in the U.S. It's not supposed to be a permanent residence. It's a low-cost, easily maintained and versatile hotel room for adventurous novelty seekers, like the iceHotel, airpod, or even a log cabin for that matter. Since when did Inhabitat readers become so staid? :) And since the only thing that's even remotely flammable is the bed unit, it seems that if it caught on fire, you could simply get up and walk out the door. Maybe this is European eco-chic, but this unit has all the amenity of an air-raid shelter, or sleeping under a bridge. I suspect any significant design ingenuity is in the SITE PLANNING and infrastructure design, with the "hostel in a park" concept implied. Maybe it could be "theme parked" with the design community's favorite scavenged/salvaged/repurposed industrial cast-offs: appliance boxes, up-turned septic tanks, and of course, for family and group rates, the ever-popular shipping container. Between the world wars of the last century, in the U.S. they were called "hobo jungles" and "Hoovervilles". What would be the trendy 21st century moniker -- "squatopia"? Or perhaps "repo-repose"? Must we always appear to be scrambling to live on a dystopian fringe? Why use trendy design-thinking to replicate conditions in the slums of Mumbai and Mexico City -- albeit like Marie Antoinette's laundered sheep, for "slumming'? Fire safe? Well at least the concrete won't ignite! These would be great as respite for the night with nowhere else to go or for camping in inclement weather. As far as being hot in Summer, I'd put curved iron over the top with an air space and over hang the ends for shade and shelter. I would though love them as bike touring accomodation, if I could fit my bike safe inside with me. Regarding ventilation, if you pay close attention, there's a tiny window in the back wall. In regards with fire safety, I don't think there's any danger with them being in an open field. and what about fire safety? If one end of the pipe was glazed that might improve the feeling of spaciousness which would other wise be lost because of the dark walls. Maybe they could utilize some LEC's to illuminate the space. Looks cool, but I doubt there's any environmental benefits. With all the high speed internet upgrades and future communication infrastructure, these pipes are better be reused. This kind of structure is often a business plot to lure ignorant consumers who believe consuming recycled is always best for the environment. The energy used to transport these pipes and upgrading them to dwelling standards is not worth the recycling. They also get very hot in summer and very cold in winter, which is very bad design idea that will increase future energy consumption. May work as pool cabanas, but not hotels. The only benefit I see is its publicity, it may interest more people to green life style. Peter makes a good point- the word recycle is often misused. The phrase 'Reduce Reuse Recycle' lists these activities in their order of importance. For something to be recycled it has to be ground up, melted down, shredded, etc. and made into something new- a production CYCLE i.e. plastic soda bottles into car bumpers. This process uses energy just as making something from scratch, but involves less resource extraction. To reuse something is better, less production energy is used and no resource extraction is involved. We used to call it salvage, now there are all sorts of hip terms (reclaim, repurpose etc) the mean more or less the same thing. Finally it's best to just use less stuff whether it's gasoline, soda cans or concrete pipes. Yuck ....close the door and then see how it might feel, no windows, no ventilation, I'm getting sweaty just thinking about it. I'd worry some youg punks would push me down the hill while I slept. I think this idea would be great for a shed in my backyard. It might be hard to collect rainwater for my rain barrel though. That's the most awesome thing I've ever seen. Really. I'd pay to stay there. In fact I want one of those in my back yard. Recycled or repurposed? I think it's an important distinction. If they weren't used, can they be described as recycled? I don't think so. If these pipes failed to pass inspection and were slated to be crushed or otherwise disposed of, then this is an environmentally friendly repurposing, but it still isn't recycling.